On Thursday, March 5th Chef Neela Paniz visited UMass Amherst for her third year in a row as part of our on-going guest chef series. Paniz is well-known for her appearance on the Food Network’s TV show “Chopped” and is widely recognized as the “Julia Child of Indian Cuisine.” Paniz says that UMass is one of her favorite schools to work at because she has established great relationships with the UMass Dining chefs and feels a sense of “coming home” every time she visits. 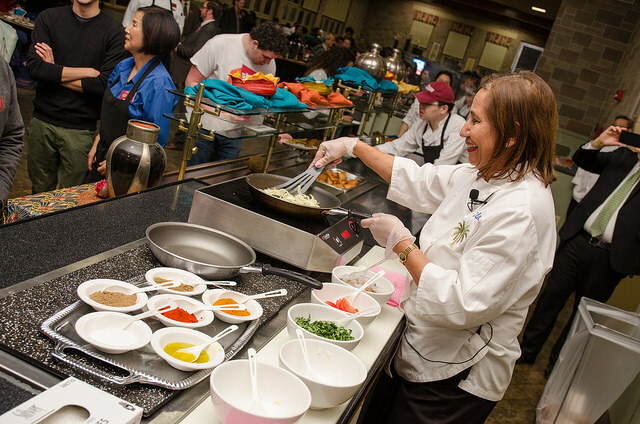 Upon walking into the Worcester Dining Commons on Thursday night, one couldn’t resist smelling the aroma of spices that filled the room. Most of the food served at the event came straight from Paniz’s new recipe book, “The New Indian Slow Cooker,” which details traditional Indian recipes that are cooked in a crockpot. Some of the dishes served were Uttapams, which are semolina yogurt griddlecakes, Bhajjias, a mixed vegetable and chickpea dumpling, Mango Lassi, a traditional Indian drink, as well as a delicious dessert made from bread, butter, and marmalade pudding. “I love the food here tonight, it’s packed with flavor,” said junior Ben Wilson, “but for me, it could be even spicier!” Well, we all have our preferences. During the event, performers from the acapella group “UMass Rang,” who are also members of the UMass Indian Students Association (ISA), sang traditional Indian music mixed with mainstream songs including “Some Nights” by Fun. and “Fix You” by Coldplay. Afterwards, one student from the ISA performed a classical Indian dance. To end the night, Neela performed a cooking demonstration of an Indian shrimp dish, which students eagerly lined up to try. The fantastic dish summed up a night filled with enthusiasm and appreciation for Indian cuisine and culture. We can’t wait to for Neela Paniz to come back next year!